There are numerous reasons for taking up the beguiling, blue-collar craft of cross stitch, ten of which are shown below. So continue reading then pay a visit to your local craft shop and start your cross stitching career today. 1. Why “blue-collar” you might ask? Well! When compared to most other pastimes, cross stitch is truly inexpensive; there’s no fancy or expensive machinery. When you have bought a kit or the thread and fabric for your own design that’s about it for outlay (well, until you buy the next one anyway). Simple kits start from a couple of dollars and you’re guaranteed something at the end of it to show for your efforts. 2. Whatever you produce, be it a tiny picture of a mere few inches in diameter, or a sampler that stretches the length of your wall, you will always have it to keep. You can even hand it down to your children, thereby creating an heirloom. 3. 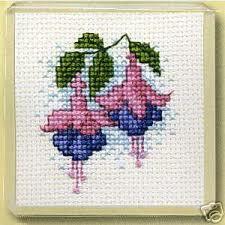 Even beginners can make cross stitch works that look both beautiful and professional. Starter kits don’t need any previous experience and as you develop your skills you can progress to evermore complex patterns. You will never have to scour the shops for that special gift again. 4. Everything you make will be unique and very personal; the perfect gift for every occasion. 5. Cross stitch is great for stress relief and relaxation. Just sit down with your favorite radio program or CD on and stitch away to your heart’s content. 6. Cross stitch is a truly “portable” hobby. You can stitch while sitting in your armchair watching the TV or alternatively you can take it with you on holiday or on long train journeys. Boredom will surely be a thing of the past. 7. The huge number of cross stitch designs available today means that there will always be something you like, regardless of your ability. Simple designs for beginners incorporate a small number of colour threads and very basic stitches so that you don’t need to go and read a manual before you make a start. However, as you progress and learn a few more stitches and techniques you can attempt more complex patterns until you really are the professional cross stitcher. 8. There are literally hundreds of websites that offer free patterns to cross stitch. You will have to buy your own threads and fabric but that is half of the challenge! There is absolutely no way on this earth that you will ever run out of things to cross stitch; it really is a hobby for life. 9. As you become more confident and proficient, you may be able to sell some of your creations thus making a bit of pocket money while doing something that you love to do. You can even advertise your talents and design patterns for individual customers. Given a few years you could have a nice little business venture as well as a great hobby. 10. Outdoor hobbies such as hill walking and bird watching aren’t much fun in the rain or in the middle of winter, but cross stitch can be done at any time of the year regardless of the weather. In fact it’s a great feeling to sit in a nice warm, cozy house on a dull winter evening and happily stitch the hours away. Overall, cross stitch really is a universal hobby anyone can master and if your curiosity does get the better of you, you will undoubtedly become hooked in no time. Historically, cross stitching has a rather vague stigma attached to it as being thought of by many as just a “pensioner” activity. But this couldn’t be further from the truth. People of all ages cross stitch, even teenagers and children… and yes men too! And hey! if you don’t believe me, have a go yourself. You’ll soon find out why cross stitch really is universally popular. John Wigham has been a professional author and editor for 20 years and is a co-founder of Patternspatch.com, an online cross stitch club dedicated to counted cross stitch. The website has a small team of writers who are devoted to our cross stitch club and enjoy writing about their hobby.